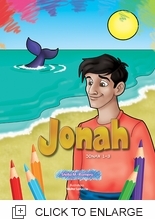 This coloring book presents the story of Jonah, a Bible character who is a favorite among little ones. Children 4 to 9 years of age can color the most important scenes of Jonahâ€™s life, while reading his story which is told in simple words. The book has a handle which makes it fun and easy to carry everywhere.